Good afternoon and thank you for visiting Never Late Electrical. One of our major points of difference is our “never late” reliability. This reliability is something we believe in so strongly that we back it with a $100 cash back guarantee. On over 40,000 jobs we have had to pay out this $100 guarantee just 16 times - that's a 99.96% success rate! Beyond that, we pride ourselves on many other important customers focused attributes including honesty, customer care, being organised and efficient, and continually bettering our operational systems to allow us to provide outstanding service and reliability. We absolutely guarantee we'll be on time - and that's backed by a $100 cash back guarantee - if we're even 1 minute late, we'll give you $100 cash! ...that we are 100% committed to and proudly stand by. All of our tradesmen pride themselves on their customer care, attentiveness, and professionalism. We can get to you on the same day for your urgent work. We also provide a 24/7 Emergency Service for all after hours work. As a homeowner, I want to be sure that work in my home is done correctly. As a business person, I don’t have time to wait all day for trades-people.Never Late Electrical provides reliable, “on-time” service, with excellent quality workmanship to an agreed price.That’s what I call service! What do the Hoggies crew say? ‘Thank God for Never Late Electrical’. Being a busy 7 day operation, reliability and professionalism is critical. 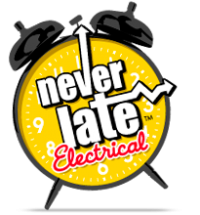 The Team at Never Late Electrical always attend our calls quickly and their expertise in the many and varied electrical applications of our restaurant is First Class. Terry White Chemist has had a long association with David and his team. We were particularly impressed by the work they did when we had our major refit. The job was difficult as we traded during the refit.The Never Late Electrical team was professional, flexible and reliable and the result… Spectacular! Not only do Never Late Electrical complete all my regular electrical work here at John Oxley Motors, but when I have an urgent problem I know I can call and they can be here within the hour. Now that’s service! Fill out the form below with your enquiry and a member of our team will be in contact with you.